How do Transitions® photochromic lenses work? by Chris Woodford. Last updated: February 11, 2019. Wearing eyeglasses can often be a pain. If it's raining, you're wiping water off the lenses; if it's humid, the lenses mist up; and if it's sunny, you don't know whether to wear your normal glasses or your shades and you may have to keeping switching between the two! Many people who wear eyeglasses have found a solution to the last of these problems by changing over to photochromic lenses—sold under popular brand names such as Transitions® and (some years ago) Reactolite Rapide. They look clear indoors or in poor light, but in sunlight they darken automatically and effectively turn your normal glasses into shades. It's pretty cool technology—but how exactly does it work? Photo: Definitely darker. I took my photochromic eyeglasses out into the light with the left lens covered, then returned a few minutes later to take this photo. The lenses darken much more given time, but how effectively they work depends on the ambient temperature and how old they are. Normal sunglasses work by blocking out some of the light in one of two ways. Most of them are really just colored filters: they let through only light of a certain color (the color of the lens) and block out the rest. Since only a fraction of the light gets through, you see a darkened (and colored) picture. The other type of sunglasses use polarization. Light travels in a wave motion—a bit like the waves on the sea. But where ocean waves vibrate only up and down, light waves wriggle in every direction. Polarizing lenses are a bit like slits that let through only light waves vibrating in a single direction. So, just like colored lenses, they let through only a fraction of the light and you see a darkened view of the world (typically grayer, rather than colored). Photo: Polarizing sunglasses block all light waves except those vibrating in one direction. So if you hold two pairs in front of one another and slowly rotate one of them, you'll see the overlapping lenses gradually turn black, then lighten again. Photochromic lenses are completely different, because they work by reacting to ultraviolet (UV) light—the light that's just too blue for our eyes to see. Indoors, there is hardly any UV light (ordinary glass windows generally filter it out) so photochromic lenses remain clear; outdoors, where there's quite a bit of UV light coming down from the sun, they darken. Photo: Early photochromic lenses contained silver compounds (such as silver chloride) and reacted to light much the same way as old-fashioned photographic film, like this. Unlike film, the reaction was reversible: the lenses soon lightened again. First let's cut through the jargon. The word "photochromic" comes from two Greek words: "photos" meaning light and "chroma" meaning color. So photochromic simply means something that changes color in response to light. Photochromic glass has been around since the early 1960s, when it was invented by William H. Armistead and Stanley Donald Stookey of Corning Glass Works (their US patent 3,208,860 describing the idea, titled Phototropic material and article made therefrom, was filed on July 31, 1962). In those days, photochromic glass worked a bit like pieces of old-fashioned, photographic film. 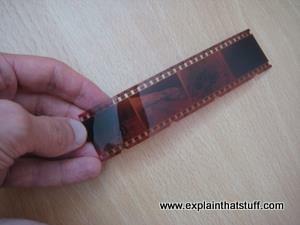 Film darkens because it contains silver-based crystals that clump together when light falls on them. Early photochromic lenses contained similar silver crystals and darkened in a similar way: when light hit them, some of the silver crystals changed into microscopic bits of silver. How can you see through lenses made with opaque silver? As Armistead and Stookey explain in their original patent, only tiny quantities of silver crystals are needed (less than 0.1 percent by volume), and each crystal is less than 0.1 microns (one ten millionth of a meter—or about 100 times thinner than a human hair) in diameter. Unlike photographic film, which darkens permanently, the photochromic lenses could change back again and clear when the light level fell back to normal. 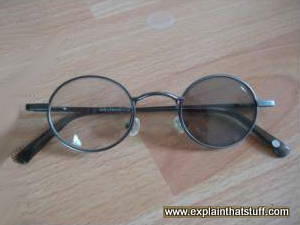 In the 1970s, the British Pilkington glass company helped to popularize photochromic lenses by introducing brands called Reactolite and Reactolite Rapide (according to the US Patent and Trademark Office, these two trademarks were applied for in the United States in 1978 and both have since been cancelled). Photo: Molecules inside photochromic lenses cut off light like rapidly closing blinds. As the molecules change their structure, they absorb more of the light passing through, and that's what darkens your lenses. Modern photochromic lenses tend to be plastic and instead of silver chemicals they contain organic (carbon-based) molecules called naphthopyrans that react to light in a slightly different way: they subtly change their molecular structure when ultraviolet light strikes them. In this altered form, they soak up more ordinary light as it tries to pass by (technically, we say they have a different absorption spectrum), which is what makes the lenses darken. Imagine lots of molecules suddenly darkening inside a clear lens. It's a bit like closing the blinds in front of your window on a sunny day: as the slats turn, they progressively block out more and more light. You might think all of this would take quite a bit of time, but photochromic lenses respond remarkably quickly. About half the darkening happens within the first minute and they're cutting out about 80% of sunlight within 15 minutes. Artwork: When napthopyran molecules are exposed to UV light, their structure changes reversibly. This diagram shows a generic example of such a reaction and is redrawn from Joseph Framingham et al's description in US Patent #3,627,690: Photochromic naphthopyran compounds. 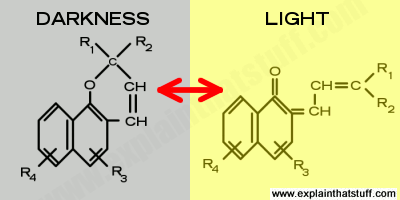 You can see that the ultraviolet light powers a restructuring of the molecule on the left, which is cleaved between the carbon and the oxygen atom. Unfortunately, it takes a little bit longer for photochromic lenses to clear than it does for them to darken in the first place. Generally, they let through about 60% of light again after you've been back indoors for five minutes. However, it can take up to an hour for them to clear completely. You might also be surprised to find that your photochromic lenses darken more or less every time you go outside whether it's sunny or not; that's because they're reacting to ultraviolet light—and there's always plenty of that about even on cloudy days. A more serious drawback is that the photochromic molecules react to temperature as well as light: they darken much more in cold conditions. This means your photochromic sunglasses will give really effective performance in winter (when you probably don't need it) and work somewhat less well in summer (when effective sunglasses are more of a priority). This temperature effect can sometimes be a real problem: the lenses can darken so much that they make driving dangerous in really cold and snowy places, so you're recommended not to wear photochromic lenses for something like driving a snowmobile! A related problem is that photochromic lenses don't always work effectively in cars, because ordinary glass windscreens naturally screen out most of the ultraviolet light. That means drivers really need a second pair of tinted or polarized sunglasses just for driving in. One final difficulty is that photochromic lenses don't last forever. After three years or so of continuous darkening and lightening, they become noticeably less reactive. This is less of a problem than it sounds, since many people change their eyeglasses at least this often. (Generally, you should get your eyes tested at least every two years and more often if you're older.) If, like me, you have a stable eye prescription and don't wear your eyeglasses too often, you might find it more of a nuisance: my photochromic lenses seem to have stopped reacting now roughly five years after I bought them. But all these things aside, photochromic lenses are a brilliant solution for people who need different glasses for different conditions and hate constantly switching between their normal glasses and their shades. Photochromic lenses are plastics that change color reversibly: they lighten up as soon as you take them away from the Sun. Lots of ordinary plastics also change color after exposure to sunlight, but not in a reversible way. 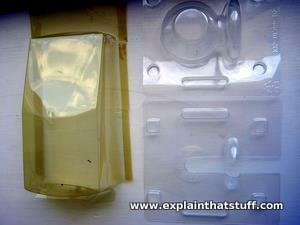 Some transparent plastics gradually turn opaque, while others that start off a clear, "white" color gradually turn yellow. This slow, unhappy color-change of plastics is called photodegradation and it's caused by the infrared and ultraviolet wavelengths in sunlight, which chop large plastic molecules into smaller pieces. Photo: Photodegradation in action. Left: This piece of plastic packaging is about 20 years old and has photodegraded so much that it's almost turned brown! It's also very brittle now and pieces break off it easily. It started off completely clear, like the packaging on the right, which is less than a year old. Photo-degradation can be a real nuisance. In 2007, thousands of brand new, bright red seats had to be replaced at London's Wembley Stadium after the Sun rapidly turned them an unattractive pink color, not long after they'd been installed. Sometimes, though, photo-degradation can be much more helpful. By breaking down the big molecules in plastics into small pieces, it can help to destroy waste that would otherwise survive in the environment for several hundred years. Some bioplastics and biodegradable plastics are deliberately designed to degrade this way. For example, incorporating a tiny proportion of carbonyl groups into the polymers (repeating, long-chain molecules) from which plastics are made can make them start to photodegrade within days of exposure to sunlight. But that doesn't necessarily help when a lot of our trash is still buried in landfills—deep, dark valleys of garbage where sunlight never sets foot. According to the US FTC, you should only believe claims that plastics are truly biodegradable if the manufacturers provide "scientific evidence that their product will completely decompose within a reasonably short period of time under customary methods of disposal." Photochromic Materials: Preparation, Properties and Applications by He Tian and Junji Zhang (eds). Wiley-VCH, 2016. A very comprehensive review of photochromic science and technology, including the latest cutting-edge applications (such as nanomaterials and quantum dots). Organic Photochromic and Thermochromic Compounds: Main Photochromic Families by John C. Crano, Robert J. Guglielmetti (eds). Springer Science, 2006. A more detailed look at photochromic compounds such as spiropyrans, spirooxazines, and naphthopyrans. Photochromism: Molecules and Systems by Heinz Dürr and Henri Bouas-Laurent (eds). Gulf Publishing, 2003. Introduction to the various applications of photochromic technology, with an emphasis on the chemistry of photochromic molecules. Physics and Chemistry of Photochromic Glasses by Alexander Victorovich Dotsenko et al. CRC Press, 1998. Describes how photochromic technology is used in eyeglasses and other optical instruments. Brighter future for cricketers by Pranav Soneji. BBC News, 26 July 2007. Cricketers are now wearing photochromic sunglasses that help to show up red balls in bright sunlight. Through A Glass, Darkly by Jim McCraw. The New York Times, February 11, 2000. Photochromic technology could soon be coming to a car near you! US Patent #3,208,860: Phototropic material and article made therefrom by William H. Armistead and Stanley D. Stookey, Corning Glass Works. Applied for July 31, 1962 and granted September 28, 1965. This is the original invention of photochromic glass: it describes the basic concept of reversible, photosensitive glass made using small amounts of silver crystals. US Patent #3,708,219A: Light valve with flowing fluid suspension by Robert Saxe, Research Frontiers. January 2, 1973. A type of photochromic glass made from electrically controlled, suspended particles. US Patent #3,627,690: Photochromic naphthopyran compounds by Joseph Casella Framingham et al, Itek Corporation. December 14, 1971. Describes the photochromic plastic used in modern plastic lenses. US Patent #4,268,134: Lightweight laminated photochromic lenses by Suresh T. Gulati et al, Corning Glass Works. Granted May 19, 1981. Describes a durable, laminated glass/plastic photochromic lens. US Patent #5,585,042: Photochromic naphthopyrans by David B. Knowles, Transitions Optical, Inc. Granyed December 17, 1996. Describes new types of photochromic plastics.